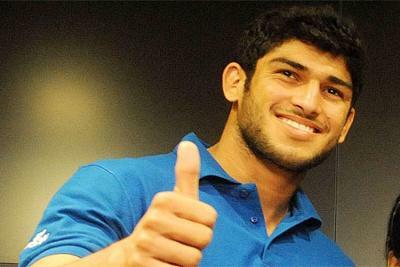 Avtar Singh..Opportunity beckons at RIO..for him and for Indian Judo. The story of India’s lone judoka representative at RIO is so similar to many other Indian athletes who may or may not be Rio bound. Fighting against odds from a very tender age, Avtar has overcome obstacles from 2008 when his local coach considered him the weakest of his students, despite results indicating otherwise. Persistent support from his parents prevented him from quitting the game and the gradual rise in his ranks began. Sports lovers may recall him representing India at the Glasgow Commonwealth Games where he lost to eventual silver medallist Mathew Purssey of Scotland in the pre-quarters. Languishing outside the top-200 mid-way through the Olympic qualification period, Avtar was desperate to participate in more tournaments to improve his world ranking. He had participated in just one-fifth of the tournaments that his rivals had. With minimal support from the Judo Federation and consequently the Government, his training programs and international trips started to suffer. Ultimately his parents had to start searching their small pockets and even exhausted their savings to fund his trip to the Turkey Grand Prix earlier this year. His hard work and parents blessings started paying off, as this 6 feet 4 inches tall judoka put up a brilliant show in the Asian Championships at Tashkent where he finished fifth. One of his victims, was the highly rated Iranian Saeed Moradi. His physique and height made it difficult to find sparring partners in India and his quest lead him to ten time national champion Cawas Billimoria. There have been further training programs in Brazil with the Japanese legend Yasuhiro Yamashita and a visit to Hungary to spar with some of the world’s best judokas. Avtar spent some time with world class Hungarian coach Rodrigue Chenet. Tough Competition awaits at RIO.. The host nations’s representative in this category is the most experienced at 34 years. Silver medallist at the 2000 Games in the -73kg category, he also added a bronze at Beijing in -81 kg cateogry. In between he was World Champion in 2007. Camilo is the only man to win the Pan American Games three times, 2007, 2011 and 2015. This is Camilo’s 4th Olympic Games. This young judoka from South Korea, is the current world champion. His results in the various Grand Prix tournaments after 2015 world championships have been average but he continues to be one the top judokas due to his aggressive style. One the hot favorites to win at RIO if recent results are to go by. Alongwith his World Championships bronze, he won the Grand Slams at Baku, Tyumen and Tokyo last year. This year has seen him lift the World Masters title. Some other formidable judokas in the form of Kiril Denisov, Ashley Gonzalez will strengthen the competition further.